In an effort to try and scope out more dining spots in my area (the oft-neglected, outskirt neighborhoods of Philadelphia known as “Roxayunk Falls”: Roxborough/Manayunk/East Falls), I found myself at the Falls Taproom on a drizzly Thursday night. Some friends of mine frequent there pretty often and had good things to say. The beer menu was solid with a great selection of drafts and bottles, and the dining menu was definitely a step up from your average bar food staples boasting charcuterie boards, mini tacos flatbreads, and even vegan wings. Naturally, I went for the beef burger; also available with bison & lamb meat, as well as a black bean option. It was topped with smoked bacon, aged cheddar and a red onion jam on a brioche bun. But first, I decided to start with some fried pickles. I was pleasantly surprised by the pickles. They were nice and thin, slightly breaded and fried to a crisp without being the thick, soggy, over-crumbed pickles you might get other places. The serving was quite generous and I polished off a fair portion of them with at least 1/4 of the plate still left over. The menu says it’s paired with tabasco mayo; I didn’t really notice a kick to it but it was still pretty tasty. Finally, my burger came out. I decided to go with sweet potato fries instead of regular fries, which turned out to be a bad move. 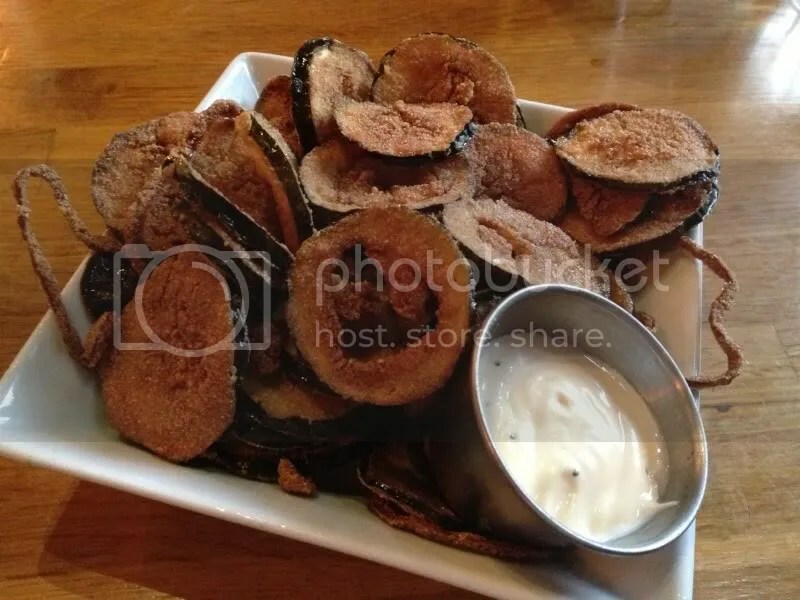 There were so many fries that I barely made a dent in them after having eaten almost the whole plate of fried pickles. 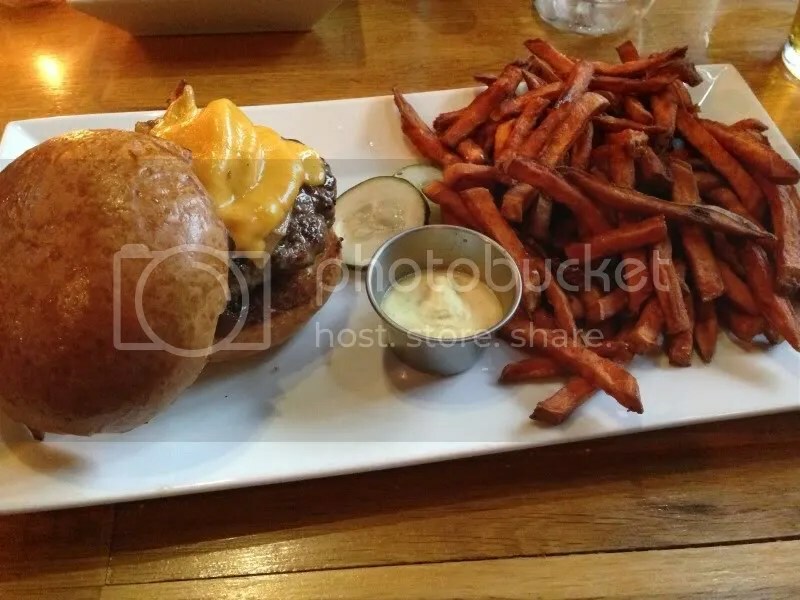 (I also realized that maybe I’m not a big fan of sweet potato fries; they were just kind of mushy tasting and not nice and crisp like hand-cut fries would have been.) I was one of maybe three other tables in the restaurant when I came in and the other two tables hadn’t ordered yet, so when my burger I requested to be cooked to medium came out well done, I was kind of shocked. I just don’t understand how kitchens can have a hard time cooking a burger to the requested temperature for a customer, especially when they aren’t busy. So, my burger was overcooked, flavorless and dry. The bacon on top, buried beneath the cheese, was also dry as well. And the bun was dry! The red onion jam added no flavor whatsoever. It was just not a pleasant experience at all and was almost completely unpalatable, no matter how much ketchup I started dousing it in. I understand that sometimes kitchens have off nights, but for one of the most simple items on a menu that a customer can order, I found it to be unacceptable. Posted in bacon, bad, beer, brioche, buns, burger, burgers, Falls Taproom, pickles. Bookmark the permalink.